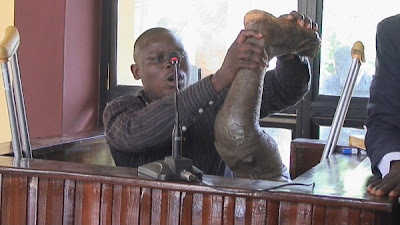 Nigerian photo of the week: Mr Segun Ajayi brings his severed leg to the Ekiti Election Tribunal. The leg had been kept in the morgue. After the court appearance, the leg was given a good funeral.. WTH???? Only in Nigeria....I swear! to fully know, but its interesting tokenism. Its momentary moment of defeat. I do not understand what is going on in Nigeria and may God our Lord help us,amen.